On the first day of fall, BAM, it was fall. It is crazy how quickly the weather changed, but this is an exciting part of the year. Fall Events: For starters, in our Marching Band and athletics programs we are beginning to have a good idea of where we stand and what it is going to take to have a successful postseason. When Not in the Buildings: I received good feedback from the blog last week regarding what happens when I am visiting buildings. So, what happens when I am not visiting buildings? It depends on the time of the year and what is happening that particular week. Last week we had to meet about shutting down the air conditioning system and flipping over to our boilers for heat. This is not as easy as it is in a home and requires planning and scheduling. We also start talking about our fall/winter grounds and bus plans. What should be put into storage and when, are we in good shape to get our winter fuel mixture for the buses, and has anything changed that would disrupt our snow removal plans. On the instructional side, last week was a great week to finish data meetings with principals, meet with teacher groups, and talk about the strategic plan and where we are in terms of completing our goals. We also submitted the second phase of our Smartbond project, which means planning for the purchase of nearly 1,000 more pieces of technology, to add to the 3,000 that we purchased last year through this state funded grant. That is also a heavy lift, and we want to be sure that we have all of the details. Add to that my usual superintendent meetings, some events, and a fundraiser, and that was a week! One of the great things about this job is that every day is different and every day is busy. A Big Thank You: I want to give a big thank you to Stonehedge fourth grader Andrew Larocca. We read about a lot of negative things but Andrew certainly canceled that with something very positive. For the past few years, and instead of birthday gifts, Andrew has tried to help different causes. This year he wanted to contribute to the Stonehedge landscape by raising money for a "Buddy Bench". A Buddy Bench is a special place where people can make friends and not be alone. The bench will look like the one pictured that Andrew and his friends are on and we welcome its addition in a few weeks. Thanks Andrew! Time to bust out the sweaters. Have a great week! Weather Changes: I hope that you had a great weekend. The weather has been absolutely amazing, and I have tried to take advantage of it before it changes! Speaking of weather changes, it was really interesting to listen to the chatter around town about Hurricane Florence. MANY of us have or do vacation in North and South Carolina, so everywhere I went people were wondering how their rental houses and condos would make it through the storm. Unfortunately, the devastation of Florence has gone well beyond property damage. The storm has taken the lives of at least 11 people and counting, and I am sure they will need help repairing and rebuilding. It has been refreshing to see how people have banded together to help those in need and my hope is that Florence is the only hurricane we need to worry about this season. An Interesting Week: I have a face made for radio, but last week I was asked to model some clothes as a part of the Syracuse Fashion Show to help raise money for the Food Pantry. I have spoken to crowds as large as 6,000 people without issue. For this event, however, I was out of my element. In the end I think it was good to feel uncomfortable and to accept a different challenge. I won't be quitting my day job, that's for sure, but I was able to wear some cool clothes! Supporting the Sports Boosters: Yesterday our Board of Education president and vice-president, our high school executive principal, and I participated in the Sports Boosters Golf Tournament. We had a blast, but that was another subtle reminder that my golf game is not going to put food on the table. We did have a great turnout though and raised money for our student-athletes! Thank you to all who donated time and resources to support our student-athletes. Competition Season: Congratulations to the Marching Band for getting their first top finish of the year! They have been working very hard since July and they are continuing to gear up for the "Dome" competition at the end of October. Our athletes are also continuing to put in solid performances so if you get a chance to get out for an event, please do! Visiting our Schools: I was asked a great question by a student during one of my visits last week. The question was what am I doing when I visit a building. Visiting buildings and classrooms is one of the most important parts of my job, and it is much more involved than posting pictures of students on Twitter. It is my expectation that each building principal is the "owner" of their building, and I expect that they will treat and care for it and everyone in it like they would their own home and family. When I get out of the car, I am looking at the grounds. Is everything cleaned up, trim, and free of garbage? People eat with their eyes, as they say, so curb appeal is important. Next, I listen to how the secretarial staff interacts with me when I buzz into the building. Are they polite, courteous, and prompt? Next, I look at the floors and walls. Are they clean, inviting, and are posters and student work up to date? Are the hallways free from clutter? Then I check in with food service, custodial, and support staff. How are things going? Is there anything I should know or be aware of? What do they have planned for the next few weeks? I then visit the classrooms. Sometimes I visit with the building principal, but because I visit the buildings so frequently, I often visit classrooms by myself where I check in with the students. Are there any new students I should introduce myself to? Did any kindergarten or first-grade students lose teeth since my last visit (that is a big deal to them)? Are there any casts I should sign (I always write "Dr. Brown was here" and the kids get a kick out of it. Next, I dig deeper. Are the students engaged? Are the teachers dialed in and having fun? How does the classroom "feel" in terms of climate (happy, tense, stressed, mellow, smooth, etc.) and what has caused those feelings? Then I take some pictures with the students because they enjoy showing off their work to you, and it provides a classroom connection to you from afar. If I am in the middle schools or high school, I talk to students about current events and how they feel about them. Sometimes I talk about volunteer opportunities, or we talk about the next time the Wildcat Nation will be together. I learn a lot from them about the life of a teenager, and I use what I learn to be a better superintendent for them. After my visit and as I am getting ready to head out, I will meet with the principal. We talk about if there was anything that I felt that just didn't seem right, or at the same time, I will congratulate the principal and teachers for an awesome visit. So the next time you read one of my tweets you will know what went into it! Open House/Curriculum Nights: Thank you for attending our various open houses and curriculum nights. They are almost complete, and we will then be rocking and rolling for the rest of the school year. West Side Support Network: Be on the lookout for meeting dates for our West Side Support Network. This is our fourth year in existence and we will again be focusing on support for those with substance use disorder as well as mental health challenges. We are always looking for new members! Well, as a Buffalo Bills fan, this season is starting out like most of the others in recent memory, but Syracuse, my favorite college team, is showing some promise! Football season also means that kids are back at school. Back to School: We had a terrific first week of school, and watching kindergartners get off of the bus for the first time NEVER gets old. A mom at one of the buildings asked me if I thought it was too much for her to be there taking a picture of her daughter getting off the bus for the first time. I told her that children grow so fast that anything you can do to capture a memory is the right thing to do! I want to give our bus drivers, mechanics, and transportation administrators a super huge thank you. Their first week was just absolutely crazy. Bus routes are established and sent out to families around the middle of August. Because students are entitled to school transportation, routes are created for every student. It is still summer, so like I used to do, many parents leave the school mailings until the last couple of days before school. On opening day, the drivers pre-check their buses and then 100 buses turn on and get rolling. Our mechanics get really pressed into service, and this year they also had the Department of Transportation in the garage inspecting buses as part of their routine inspections. While the drivers were out driving, parents were calling into the transportation administrators with changes; 200 to be exact, the morning of opening day alone. Somehow they make it all happen. They will drive 1,000,000 miles before the year is over. Remarkable. This week we will really know who is going to utilize their bus pickup and who isn't, and we will then make the final bus route and timing changes for the year. I certainly appreciate your patience and at the same time really applaud our people for getting the job done. 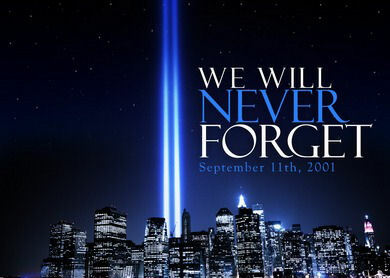 Remembering September 11: Tuesday is September 11. September 11, 2001 to me is always in the present, but to our students it is history. On September 11, 2001, I was a brand new Superintendent not knowing if we were under attack, and if we were, what I was going to do about it. One of our teachers spoke to her brother from my office. He was in Tower II and told her he would be fine. She hung up and about ten minutes later, Tower II collapsed. All I could do was tell her I was sorry, drive her home, and then get back to work and figure out what to do next. I remember that day like it was yesterday. Our students don't remember that day at all but they learn about it in their history classes. It got me to thinking that life-changing historical events are generational and stick with some people like they happened yesterday. To others, they are events that don't hold the same level of emotion for them; but they are learned. There is no disrespect there; just perspective. I was not alive for John F. Kennedy's or Martin Luther King's Assassinations for example, but my parents can tell you exactly where they were when those events happened, just as they can about the moon landing. I had to learn about those events but deeply understand their significance. When I visit with our older students this week I am going to ask them what events in their lives have occurred that were so moving for them that they remember exactly where they were and what they were doing. Should be interesting to hear what they have to say. Thanks again for reading and have a great week. As much as I love the great New York State Fair, I just could not go again yesterday. Nine times was enough for me this year. I think it might have been the heat, or that every time I went I probably spent six or more hours there! I already asked about having a Wildcat hockey game in the Exposition Center this year but was told "not likely"; that won't stop me from trying! I do want to give a "shout out" to sophomore Gabby Mitchell. 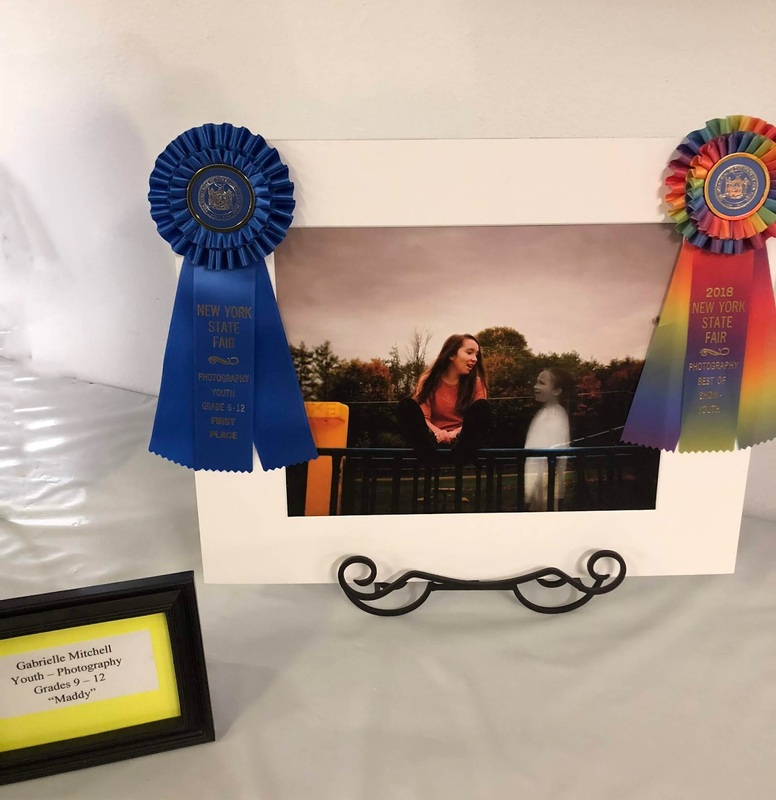 She is an incredibly talented photographer and her photograph, pictured, was the winner, "Best in Show", of ALL Youth submissions at the New York State Fair. She has won awards for other works as well. With two years of high school left, we certainly haven't heard the last of her. Congratulations, Gabby! Also deserving of congratulations are our fall sports student athletes. They have started their seasons very well and have the promise to do some great things this season. If you get an opportunity to get out and see any of the contests please do. I will certainly keep you posted on their progress. Marching Band is also getting ready to start their season, and I am looking forward to what they will do! We are fortunate to have air conditioning in each of our buildings and it will be put to use this week. As we return to school, please know that we will keep all of the kids cool the next few days. We will also make the right decisions regarding the heat for our student athletes and Marching Band members. Looks like once we get to Friday we will get back to more normal temperatures for this time of the year. Also please remember that we are going to have 100 school buses on the road along with our parent, student, and community traffic. Use a little extra care, look both ways, and we will get this school year kicked off safely. Thanks and I will be posting a lot of pictures on opening day on my Twitter account, @cbrownwgcsd! Take care and here we go!